Last week, I reviewed a book that I considered one of those books you love to hate. This was mainly because it had characters that you did not like and a plot that seemed totally unbelievable in relation to marriage. The wife ultimately finds out a huge secret about her husband that changes everything. For those of you who are not fans of that sort book, I have a recommendation for a book that has the same idea of a wife suddenly learning brand new information about her husband that is much grittier and more developed. 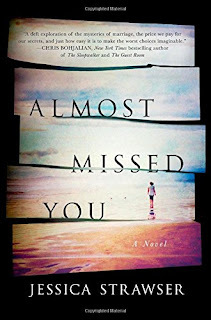 Almost Missed You by Jessica Strawser is a nuanced novel that openly explores the price of secrets in a marriage and friendship. The novel begins with the central character’s husband running off with their young son. According to Violet, they had a great marriage and were meant to be. However, as Violet is interviewed by the FBI, she learns that her husband has hidden a powerful truth about his life before her and what ultimately led to the two of them having a child and getting married. Here is the thing – lots of novels attempt this same thing. But, Strawser does a great job of making her big reveal much more believable and relatable to the audience. It is still extreme, but because her characters are fully developed, it is much easier to consider how these occurrences shaped their lives. I have always been a fan of the “butterfly effect” novels, and that is what you get in this novel. How only chance meeting leads to one thing which leads to another and another. Enveloped within the story of Violet’s marriage ending and her child’s kidnapping, readers also come to learn about her best friend, Caitlin. Caitlin’s is put into a difficult place between protecting her own secrets and telling someone else’s. This was a book that I could not put down and am recommending to all my book club friends. I think it has the potential for interesting conversations about secrets, love, marriage, chance, fate, betrayal and friendship.